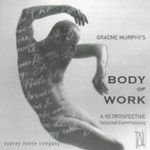 Body of work : a retrospective. 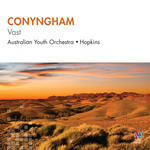 Vast III : the Centre / Barry Conyngham. Instrumentation: Solo violin, 2 flutes (2nd doubling piccolo & alto flute), 2 oboes (2nd doubling cor anglais), 2 clarinets (2nd doubling bass clarinet), 2 bassoons (2nd doubling contra-bassoon), 4 horns, 2 trumpets, 2 trombones, bass trombone, timpani, percussion (2 players), harp, piano, harpsichord, celeste, DX7, strings. Commission note: Commissioned by Australian Bicentennial Authority.